The creeping wave is a well-known phenomenon in seismology and in non-destructive evaluation. 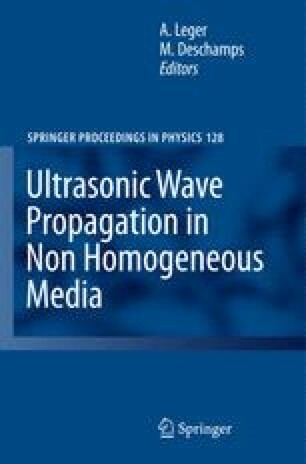 This wave which is generated at the interface between two media radiates during its propagation as a head wave. The amplitude of creeping wave is usually small compared to the compressional and shear waves. However, in some configurations, especially near critical angle (at backwall reflection, for instance), its contribution to the echo response may be significant. Such a case is discussed in this communication, both theoretically and experimentally. Computation of echo response of this wave, based on ray theory has been developed. The resulting model combined with bulk wave modelling is compared to experimental measurements.